I initially found this recipe on Pinterest, and I followed the recipe initially, from HERE. After you've cut the tops off, you take a spoon and hollow them out. 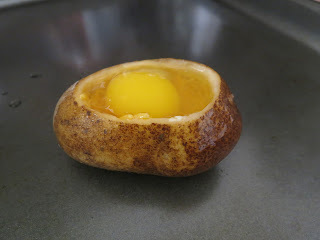 Then you take some butter, and take an egg, and put it inside, being careful not to brake the yolk. The original recipe called for spices, and bacon bits. 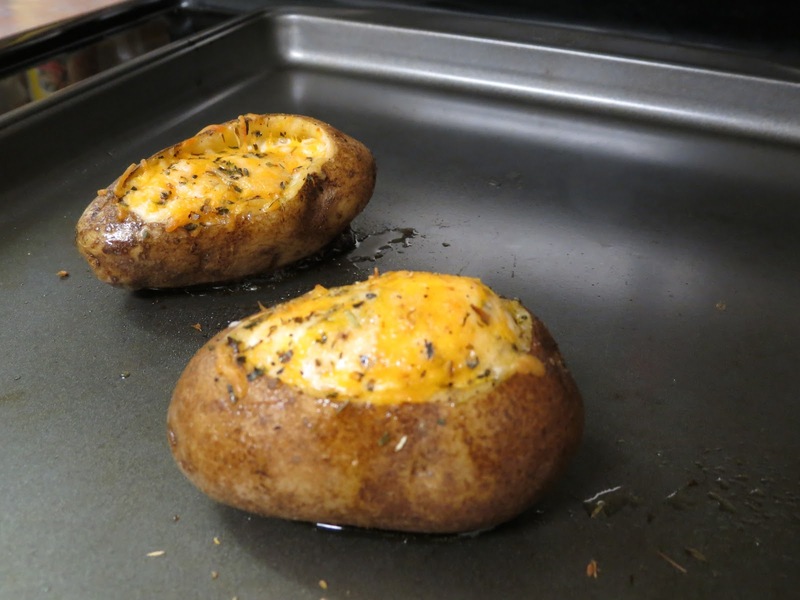 At the time, when I did the first one, I didn't have any bacon bits handy, so I just seasoned, and added cheese. I have tried it with the bacon variation too, and I loved it just as much! The only thing I found was that with the recipe with bacon (I added a ton of bacon!) the recipe, called for it to be cooked for 20-25 minutes. But with all of the bacon on top, the egg wasn't cooking all the way through in the time frame. So I actually had to keep them in for about 32-35 minutes. 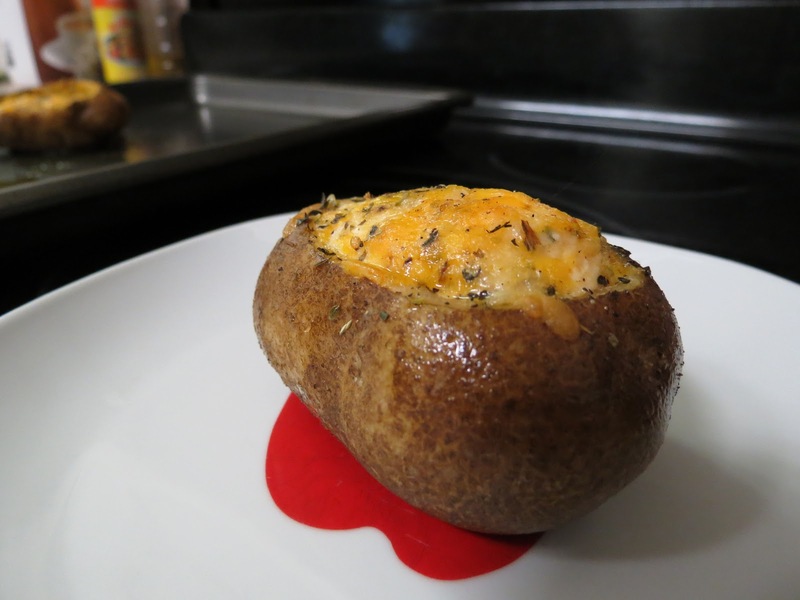 With the cheese version that I made here, the egg did cook all the way through in the 25 minute range. So if you are trying it with lots of bacon, be sure to cook it a little longer. So after the egg step, add on your cheese, and your spices. I personally used taco blended cheese, a 5 spice seasoning mix, and just a dash of salt and pepper. 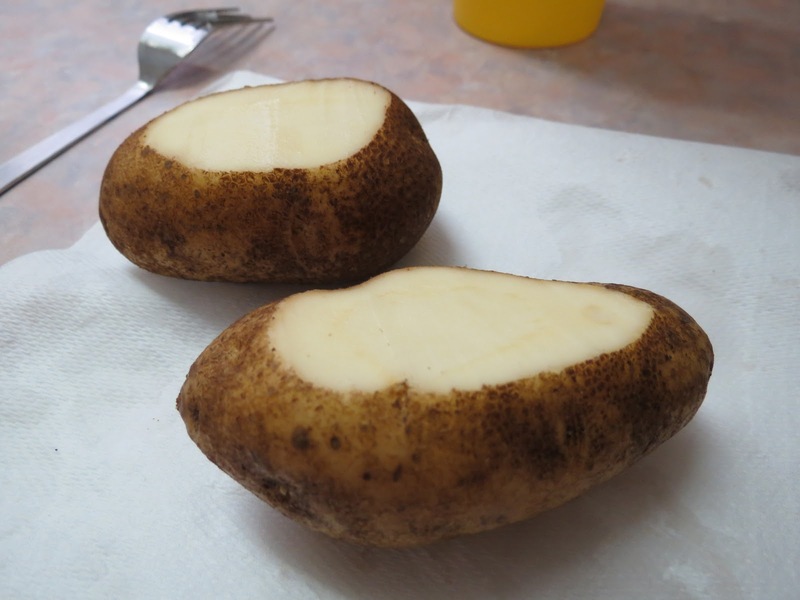 I also rubbed the potato in olive oil. And then in 25 minutes.. Voila! 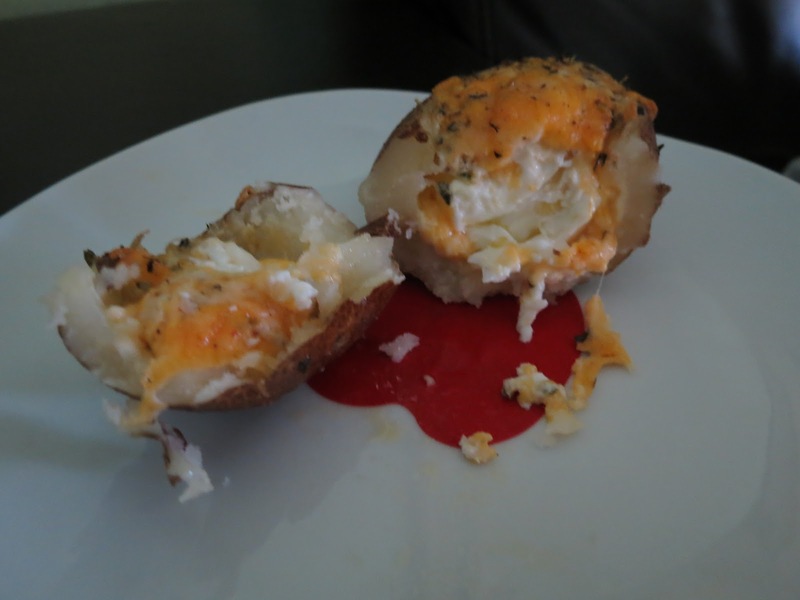 but here was the inside of the potato, with the delicious cheesiness, and the egg! In the recipe it says to put the egg, and then the cheeses and stuff. But I did cheese, egg, then more cheese.. lol.. What can I say? I love cheese! I'm not a big egg fan either, but with all the cheesy deliciousness, you can't really get a huge taste of the egg. This has really been a big hit here. Everyone in my house loves them. I love making them, and I love eating them, but my wrist gets so tired scooping out the potato, lol. I know this is something different, but if you guys like seeing my finds, and trys, I'll try sharing a bit more often when I try new stuff :) - So please let me know. YUMMERS - love the egg inside....might just try this tonight!!! This sounds pretty yummy, I think it would be amazing with the bacon. Thanks for sharing the recipe! I've heard of twice baked potatoes, but never seen anything like this before! It's a perfect Man's breakfast in a Woman's fashion style! lol. Eggs, bacon, potatoes and cheese. Oh yum! These are super cute. 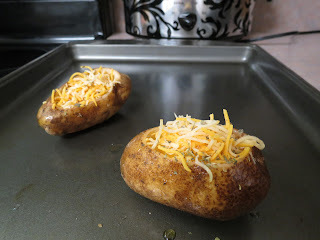 We make twice baked potatoes a lot and we add broccoli to your recipe above...it's so good! I keep falling onto recipes this morning that ALL look so yummy! it's making me hungry! I love these kind of recipes for potatoes... I am definitely pinning this to try it. Too bad my son doesn't like potatoes... oh well! more for me! That looks amazing and pretty easy too! We love potato bowls. This looks absolutely amazing. Thanks for sharing! They look so good! i'm gonig to try them!! Those look delicious. Thanks for the recipe. I'm going to have to try and make them soon. These look yummy! I never would've thought to put an egg in there but now I really want to try it! I have done this several times and I come back to say 'thank you' for the recipe! My husband loves it! So interesting. Definitely never seen anything like it but I bet it is delicious. I would love to try this recipe. I really like the microwavable bacon (if you haven't tried it, it's awesome!) so I wonder if you used that kind, microwaved the bacon first and then baked how that would turn out? Maybe I'll try it and find out! On cool mornings, I sometimes will make something like this in a custard cup and add sour cream before baking. I never thought of a potato. Looks really gooc. This looks really good! Making it my own, I think I might just use egg whites instead of including the yolk. Oh I've gotta give this recipe a try, looks and sounds yummy ! your pictures ARE pretty good in that I'm sooo hungry wanting one of these- will you adopt me? I like the addition of egg, too, it adds more protein along w/the cheese. Yum!!!! This is marvelous! I am going to try this tomorrow. Oh yummy this looks so delish! Ive got to try this! I know it would be a huge hit at my house too! I've never thought of putting an egg with a baked potato. I'm definitely going to try it with the cheeses and bacon too. Thanks for sharing. make them all the time but we call them twice baked potatoes...they are always a big hit & sooooo good! This looks so yummy!! I'm a huge bacon freak so thanks for the heads up about cooking longer w/bacon. Never seen or heard of this.But looking at it, it looks awesome, delicious and yummy. But i must try it on friday, for weekend purposes. This is a great little recipe! I hate to cook and the fewer ingredients something has the better. You could have this for dinner or breakfast. It's kind of like having eggs with hash browns. Thanks for the idea! Looks good! I've never heard or thought of doing that before! This can work for any meal of the day.. i never thought about eggs but why not we eat eggs and potatoes all the time! Yummy and easy, it's a winning combo. Thanks for the recipe. Those look so good. Would love that for breakfast. The potato, the eggs and other toppings looks like a great mix. This Looks So Good Can't Wait To Make Thank You! What a unique idea that sounds absolutely delicious! Love the cheese and bacon in it. What a great idea- I even have all the ingredients in the fridge! Never thought about making potato bowls at home. Great idea. Thanks for the recipe it looks so good. Yummy!!! You're right, this is different. But, honestly, I get sick of eating the same thing all the time, and I love eggs, potatoes and cheese, so I may be trying this one soon. Thanks! such a yummy recipe! my husband would love this! Wow! They look lovely. I never ever thought using a potato as a bowl ever, very creative thought! oooh, I love this. I have to try this! wow! Now that's totally unique! I never would have thought of putting an egg in it like that! I'm sure this is really yummy! These look absolutely delicious and easy to do besides! I want try out!